Tullibardine Distillery stands at the western end of the village of Blackford, which itself stands in the shadow of the Ochil Hills and on the north side of the main A9 about half way between Stirling and Perth. This makes Tullibardine one of Scotland's most easily accessible distilleries: and yet both the whisky it produces and the distillery itself remain less well known than they ought to be. Tullibardine Distillery is not a pretty distillery in the traditional sense: and neither does it carry what is usually recognised as the "signature" of a distillery, the pagoda that in many older distilleries would once have topped off a drying kiln for malt. These are so iconic that even though the large majority of distilleries no longer malt their own barley, those that have pagodas have tended to keep them. But they say that you shouldn't judge a book by its cover, and that slightly tired old cliché was never more true than it is at Tullibardine Distillery. Those who take the very slight trouble to turn off the A9 into Blackford arrive at one of the friendliest and best run distilleries they are likely to find anywhere, offering several different tours to suit different levels of interest and knowledge. These range from the "Standard Tour" taking about 45 minutes through the "Bonded Tour" at around 90 minutes to the full two hour "Connoisseur Tour." Some tours require pre-booking: see links on the right for further information. Two other factors make a visit to Tullibardine Distillery a particularly attractive proposition. The first is that the internal layout means that most of the key stages in the production process are housed in one large area. This produces a space with a huge amount of character and a lot of visual appeal: it also makes the processes a little easier to understand for those on their first distillery visit. The second is that the distillery visitor centre forms one end of the Eaglesgate Retail Village. Even the best distillery tours are not everyone's idea of a good time, and the combination of different attractions on one site means that you can enjoy your tour of the distillery secure in the knowledge that other members of your party are having an equally good time shopping. The distillery visitor centre is a large white building bridging the corner between the distillery and the retail development and carrying the logo "Tullibardine 1488". This is a reference to an important early customer. Pure water flowing down from the Ochil Hills is an important factor in the success of Tullibardine as a distillery. It was an equally important factor for those who by the 1100s had established a brewery on the site now occupied by the distillery, one of three that once operated in Blackford. Such was the fame of the brewery here that in 1488 King James IV asked it to supply the beer for his coronation. The brewery on the site fell out of use in the early 1900s, and in 1947 it was purchased by a Welshman by the name of William Delme Evans with a view to conversion into a distillery. Evans was an engineer and set out to design a distillery which operated with the maximum possible efficiency. Elements of his design remain very obvious today, including the single room layout of the production processes and the efficient way that heat is extracted and recycled using condensers. The first spirit emerged from Tullibardine's stills in 1949. In 1953 Tullibardine Distillery was sold to the company of Brodie Hepburn. 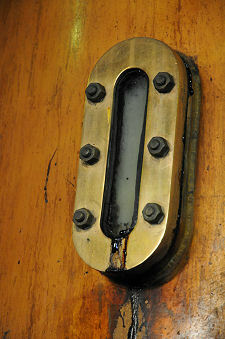 Later decades saw a number of further changes of ownership. Invergordon Distillers took over in 1971 and two years later they doubled the capacity of the the distillery by adding a second pair of stills. Another takeover followed in 1993, but the outcome this time was rather different and in 1994 production ceased and the distillery was mothballed. In June 2003 the distillery and existing stocks of Tullibardine whisky in bonded warehouses on the site were purchased by a group of four private individuals with a passion for whisky: and that December, production recommenced after a gap of over nine years. A visitor centre opened late in 2004, and the neighbouring retail village has arrived on the scene since. The visitor centre offers a warm and friendly welcome. It also has a shop carrying a wide range of quality whisky-related (and non-whisky related) goods plus, of course, whisky produced by the distillery. At the rear of the visitor centre is a nice cafe selling Starbucks coffee plus a range of home produced cakes and light snacks. You can find out more about Making Malt Whisky from our series of feature pages showing the stages in the process, but your visit begins at the point where the malted barley arrives on the premises and is milled in a highly traditional Porteus Mill, made, as the large maker's plate reveals, by Porteus of Leeds. You then mount the stairs to the main production area, entering close to the large stainless steel-capped mash tun. Off to one side is the area housing the collection of iron washbacks, as usual complete with a gridded floor that allows a glimpse of the true depth of these vessels which rise up from the level below. The only drawback of a single production area is that while you have been looking at the mash tun and the washbacks, you will have been at least partly distracted by the real stars of any distillery tour, the stills, which at Tullibardine are set half a level lower than the floor servicing the mash tun and washbacks. 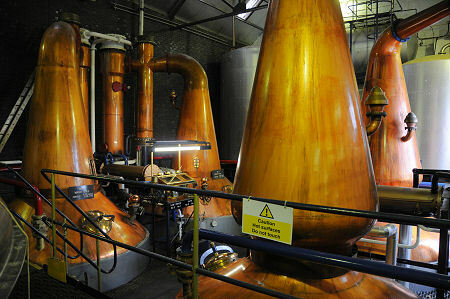 This is a great arrangement that allows you different views down onto the stills before actually visiting them in person. There are two wash stills and two spirit stills at Tullibardine, carrying the common colour coding of red fixtures and pipes for the wash stills and blue fixtures and pipes for the spirit stills. The wash and spirit stills also have separate spirit safes, in which you an see the clear product emerging from the process. 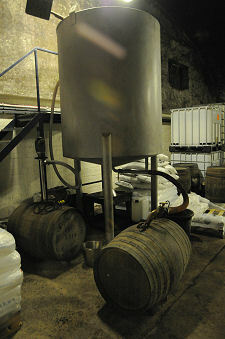 Next you enter the area where the spirit is put into casks to begin the long process of turning into whisky. This maturation is part of the process usually unobserved except by comparing your memory of the clear spirit that emerges from the stills with the range of colours seen in whisky bottles. Bonded warehouses tend to be cool, quiet places where you only get to see the casks themselves. 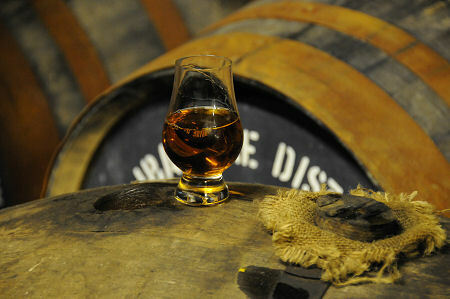 At Tullibardine, however, some of the more in-depth tours offer the opportunity to see what the liquid inside the casks looks like, and learn how the different woods from which the casks are made and the different drinks that occupied them previously affect the appearance of the maturing spirit as it is drawn out for display in glasses. The tour concludes with a visit to the tasting room, before you re-emerge in the back of the visitor centre, reflecting on a great tour of an excellent distillery conducted by people who really care about showing it off to visitors.